Thomas and his partners are very friendly. They took the time to assess the problem. They figured out the problem when 3 plumbers before them could not. They are the best! Had TJ come just to work on my garbage disposal originally. They convinced me to look at the Halo 5 and had it installed two days later. Crew was very courteous, knowledgeable, and made sure to let me know everything that they were doing before they did it. Thomas Salvato, "TJ", did an outstanding job with my garbage disposal replacement and toilet repair. He was prompt, polite, professional and efficient with his work. If I need a plumber in the future I would definitely request him and would refer him to anyone in need. TJ did a fabulous job, and made sure everything worked properly. Good. Thomas was knowledgeable. Very nice. 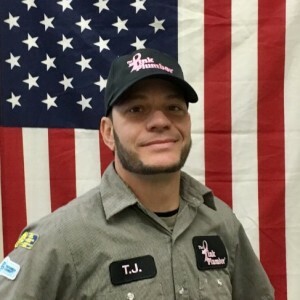 Thomas S. (TJ) is an incredibly skilled plumber with incredible work ethic. Our first issue we had to call Pink Plumber late in the evening on a weekend, it was a stubborn clog. He made sure it was fixed. In fact, he was here until about 2:00 am. When we had a similar problem a year and a half later, we were thrilled to get TJ back! He explains everything; he is very kind; there are never any surprises in his estimates or bills; and he is also very good with dogs! We are very happy with the service that was provided and my showers have never looked better. Thomas S. Did an outstanding job! I was very please with work preformed and his professionalism. I would hire Thomas S / pink plumber again. I will refer them to friends and family. Thank you pink plumber for an awesome experience . Very knowledgeable and was able to fix the plumbing. Good Job. Thomas S was great. He explained everything and was very thorough. Nice guy! Thomas was incredibly thorough and explained things so well. He wanted to be sure you understood what he was about to do and the cost. He did an awesome job with repairing and cleaning up afterwards. Thomas explained what he was going to do and how he was going to do it. 5 stars 2 thumbs up and a gold sticker! Had the Pink Plumber come out for a 2nd opinion as felt first company was out of their minds as the other company said I needed complete sewer pipe repair under foundation and backyard. TJ had me watch scoping video with him and showed me everything so I could see what he was seeing. After going over everything all I needed was 10 feet of sewer replaced that was damaged due to tree root, rest of my pipes only need a cleaning not replacing. By calling Pink Plumber I got an honest answer and saved me over 10k in unneeded pipe replacing. Pink Plumber is now my go to plumber. Quick response! Very helpful and knowledgeable. Thanks for bailing me out again! Moved in to new house on Friday only to find out I had no hot water. Called Pink Plumber Saturday morning. They sent TJ out and he replaced the hot water heater on the same day. Not only that, TJ took the time to check out the rest of the plumbing in the house. I now have a plumber I can trust. Highly recommend.